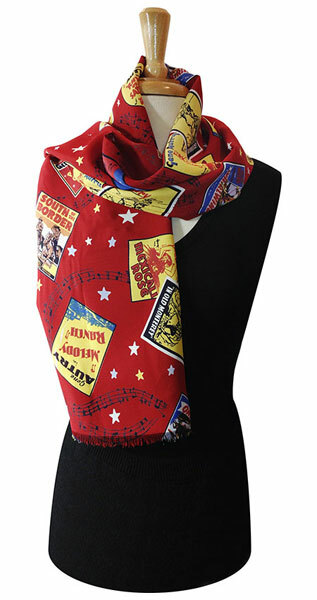 In celebration of the Autry Museum's 25th anniversary, Gene Autry Entertainment and the Autry Museum have created three limited-edition scarves featuring original Gene Autry movie poster art from the 1930s, '40s and '50s. 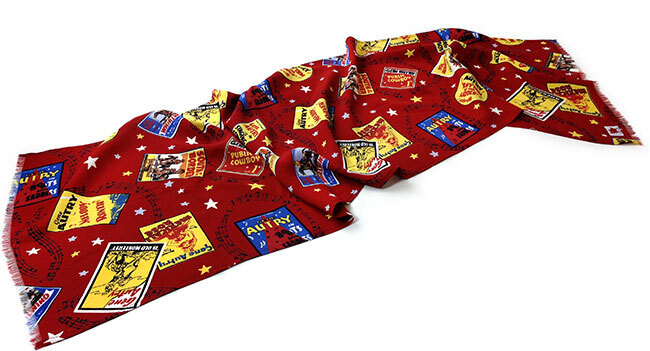 The fabric was created for the Gene Autry Centennial and includes poster art from the films The Singing Cowboy, Boots and Saddles, Rhythm of the Saddle, Mexicali Rose, In Old Monterey, South of the Border, Melody Ranch, The Strawberry Roan, and Whirlwind. Worn by cowboys in a bygone era, this unisex scarf now serves a similar purpose of acting as an insulator, as well as creating a fashion statement.